Preheat oven to 400° (if you are using a dark or glass pan – 425° if you are using a light color pan). 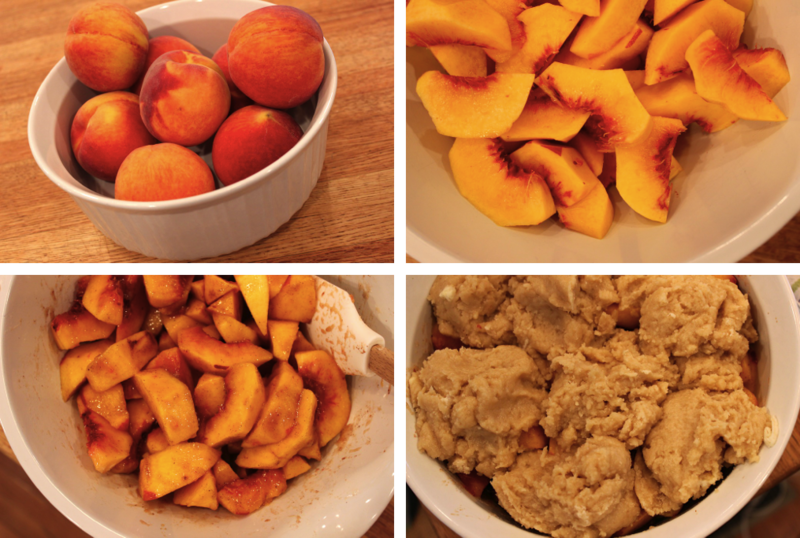 In a large bowl, combine peaches, 1/4 cup white sugar, 1/4 cup brown sugar, cinnamon, nutmeg, lemon juice, and cornstarch. Toss to coat evenly, and pour into a 2 quart baking dish (Mine was 2.5 quarts). Bake in preheated oven for 10 minutes. Meanwhile, in a large bowl, combine flour, sugars, baking powder, and salt. Blend in butter with your fingertips, or a pastry blender, until mixture resembles coarse meal. Stir in water until just combined. 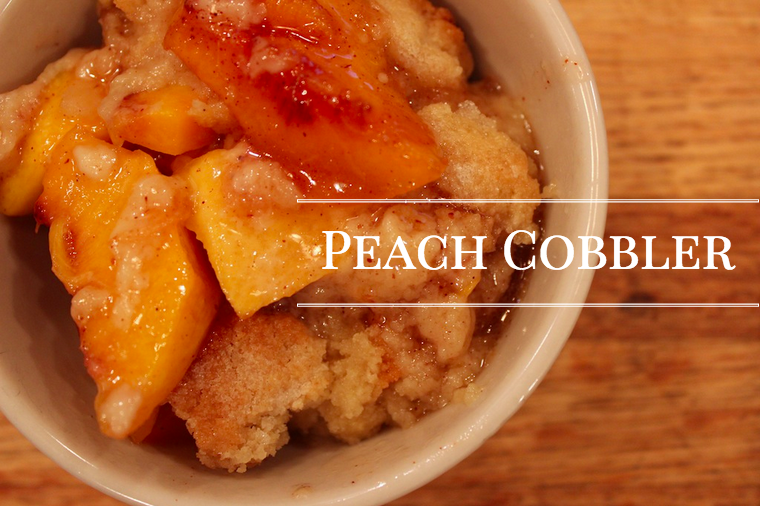 Sprinkle entire cobbler with the sugar. 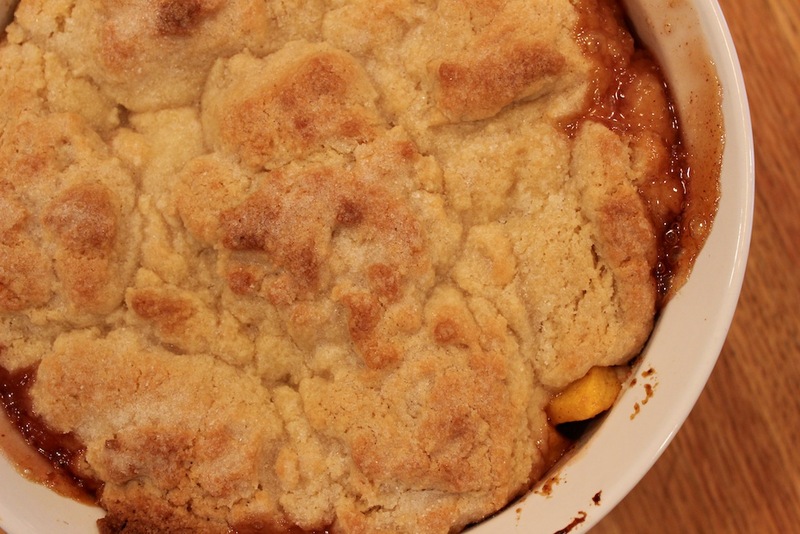 Set your baking dish on a baking sheet (this cobbler can drip into the oven otherwise). Bake until topping is golden, about 30 minutes. Fall is most certainly in the air. The leaves are changing, the temperatures have been perfect, and I just discovered my new favorite latte at Starbucks, toasted graham (sorry pumpkin, dare I say you’re starting to over do it for me?!). 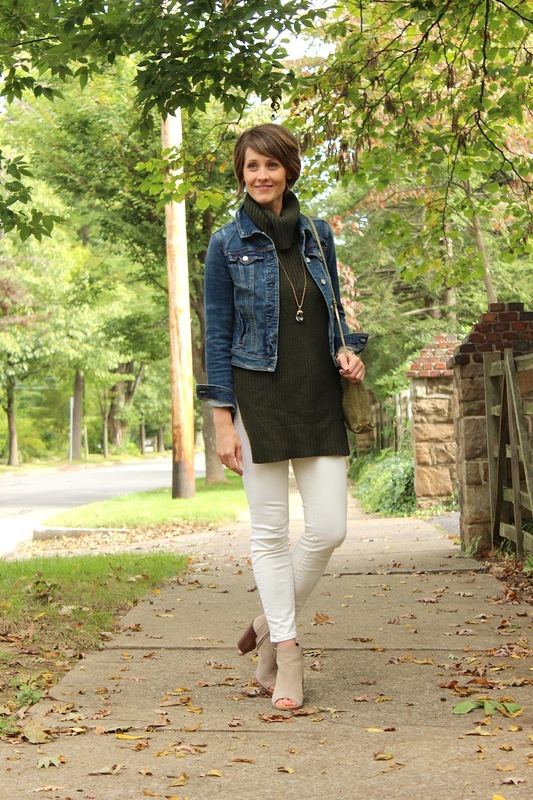 I’ve been on a kick lately of pairing my fall pieces with light denim. It has such a fresh look about it that I love. I grabbed this turtleneck sweater when I was in NYC a couple of weeks ago and I’m loving it. Sleeveless may seem odd, but to be honest it’s perfect as it allows you to layer over it or under it without making things feel too bulky. I threw on my denim jacket here but I plan on wearing long sleeved layers underneath as the temperatures continue to drop in the months to come. Toaster Strudel’s are one of those foods that feel nostalgic to me. I haven’t had one in ages, but I can remember exactly how they taste. 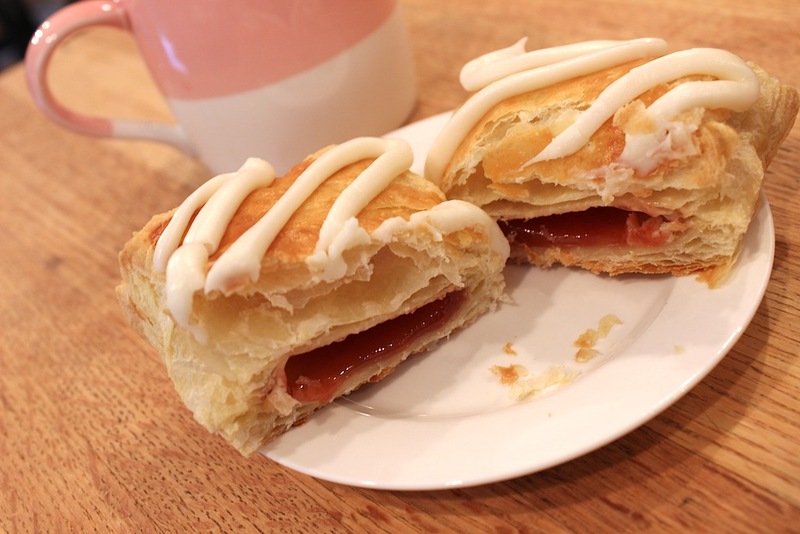 I loved finding them in my mom’s freezer and looked forward to pouring that tiny icing packet on top of the freshly toasted strudel, yum! Well, when Cooking Classy posted her homemade strudel, I knew I had to make them. Don’t worry, they aren’t all that intimidating because it calls for pre-made pastry as well as jam, but it turns into something amazing. Let’s just refer to them as the sophisticated toaster strudel, shall we? Be sure to seal all edges completely so that you don’t have any leaks as I did with one. Then just sit back and watch them puff up and turn golden brown! Preheat oven to 400 degrees. Line a baking sheet with parchment paper or silicone liners. Place 1 sheet of puff pastry on a lightly floured surface and cut into 6 equal rectangles. 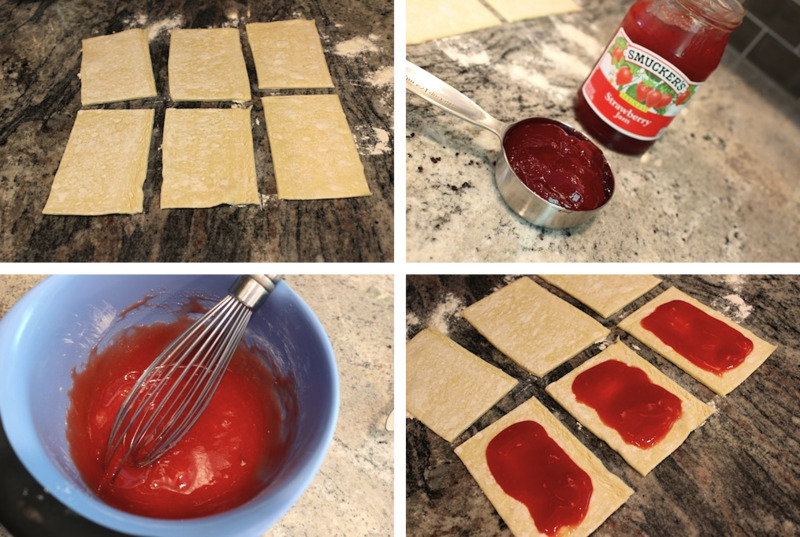 In a small bowl whisk together jam with cornstarch then spoon 1 1/2 Tbsp jam over top of 3 of the rectangles, leaving about 1/2-inch rim around all edges uncoated. In a small bowl whisk together egg with 1 Tbsp water. Lightly brush rim (section around edges not covered with jam) with egg mixture. 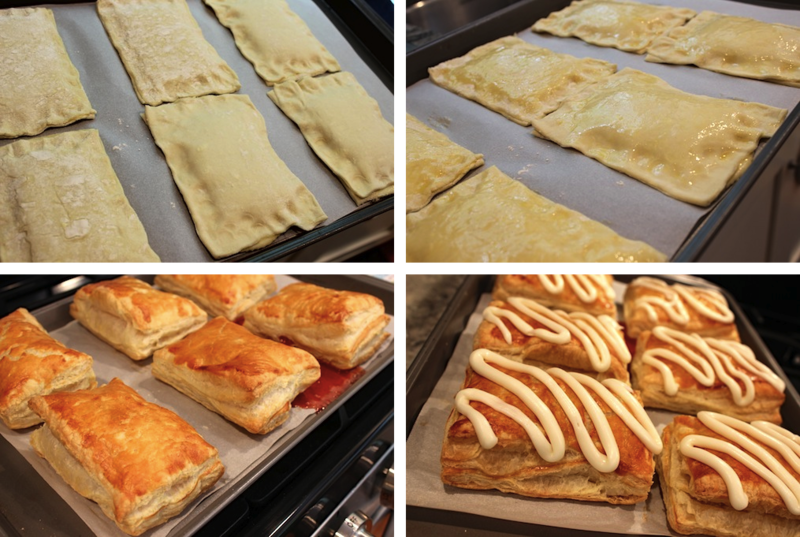 Layer remaining puff pastry rectangles over jam coated puff pastry and press edges to seal, transfer to refrigerator while preparing second batch and repeat process with remaining sheet of puff pastry. Brush tops of each strudel lightly with egg wash. Bake until golden brown, about 20 minutes. Let cool on a wire rack until warm then drizzle icing over top. Hi guys! Hope you all had a great weekend. I came down with the dreaded change of season cold/ sore throat yesterday and am hoping it decides to pass quickly! Here’s an outfit I pulled together for a cookout at my parents house. Remember that vest I found at Target? Well this dress got thrown into my cart that same day. I can’t say I do a ton of shopping at Target, but these two items were home runs for me. 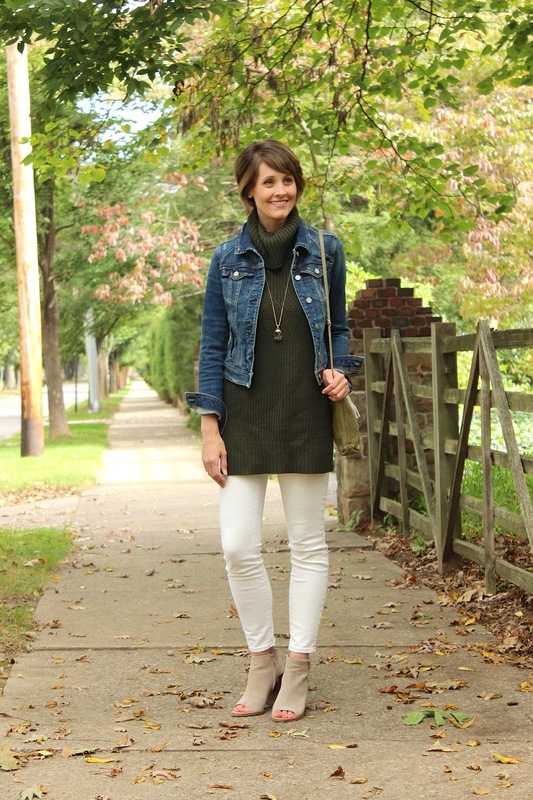 The dress is great on it’s own but it’s also perfect for layering. Under a vest while the weather allows, but it’ll also look great under a jean jacket or blazer with some booties as the season rolls on. This week has been a bit of a whirlwind. 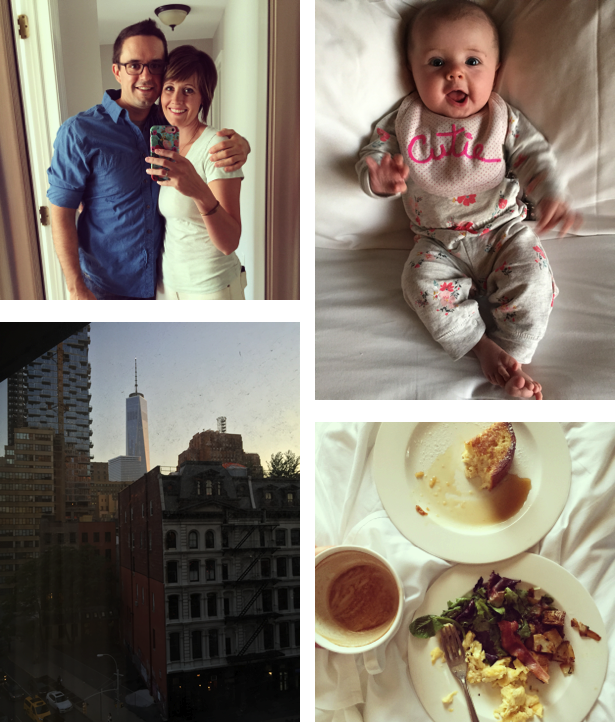 With school events, sporting events, our anniversary and a quick trip to NYC, Friday arrived in no time! Jack had a meeting in the city that happened to fall on our anniversary so as I often do, I tagged along and brought Audrey for her first venture into the big apple. This doll was such a trooper! She barely made a peep the whole trip to/from and was the perfect partner to people watch as we walked the streets of SoHo. She also managed to dose off in my arms (she doesn’t do this often anymore) as we had dinner and listened to live jazz in our hotel. A little (okay, a BIG) breakfast in bed, a quick stroll through our old city of Hoboken and we were on our way back home. Thankfully my father-in-law and mother held down the fort with the other two while we were away! I spent more time strolling around than I did shopping, but I did wander through Anthro (it’s a magnetic force with that store I tell ya!) and fell in love with more than a few things. I was most drawn to all of the sweaters though. Here are a few that caught my eye. 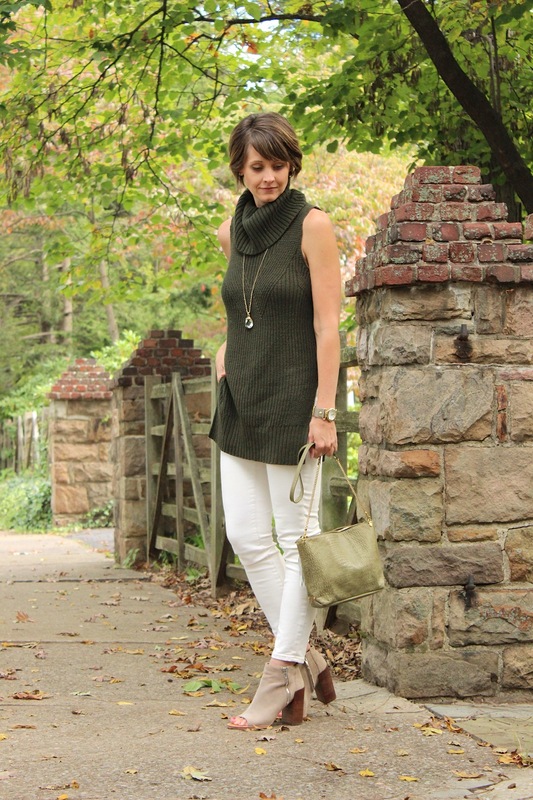 The olive turtleneck tunic (which looks much better in person) came home with me and I can’t wait to wear it! Have you guys started stocking up on sweaters for fall yet?? Today I wanted to share with you one of our recent projects around the house in case any of you have something similar. 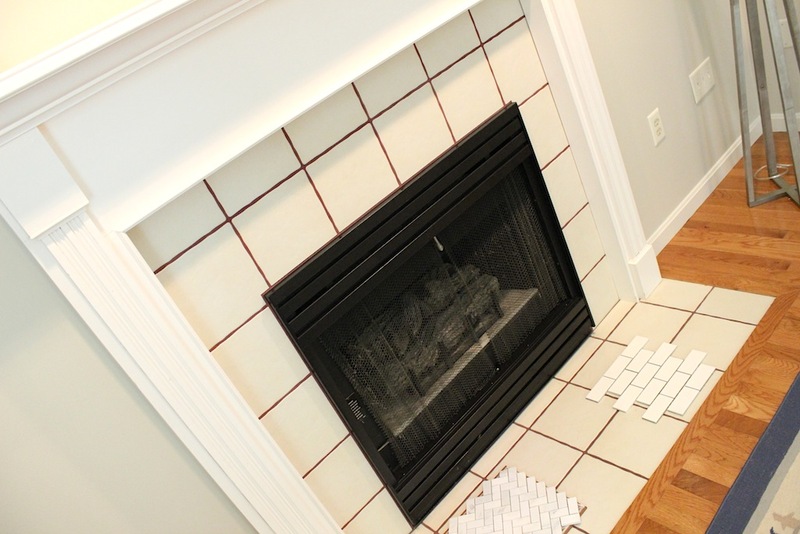 Our home was built in the 90’s and the fireplace won’t let you forget that! We have plans to retile it as well (as you can see some samples I was looking at) but one change we wanted to make sooner than later was to banish the brass pieces that stood out like a sore thumb. As I typically do, I turned to Pinterest and quickly found my answer there. 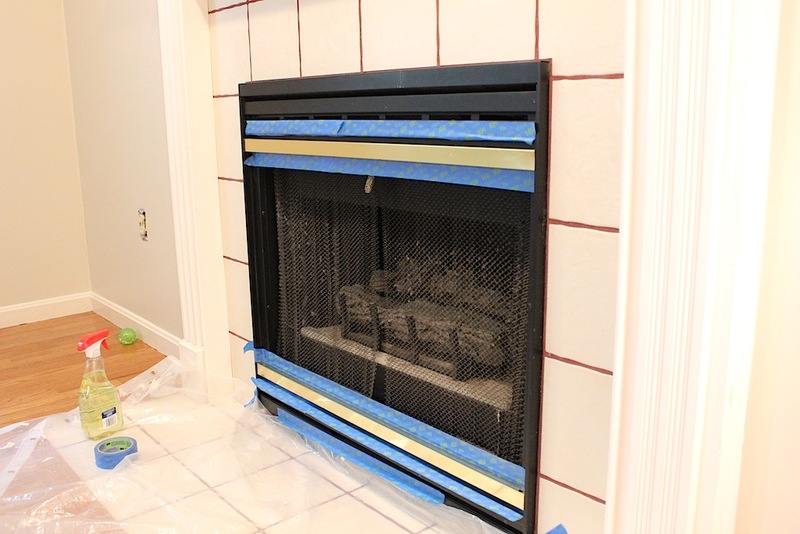 A little Rustolem high-heat paint was exactly what our fireplace needed. 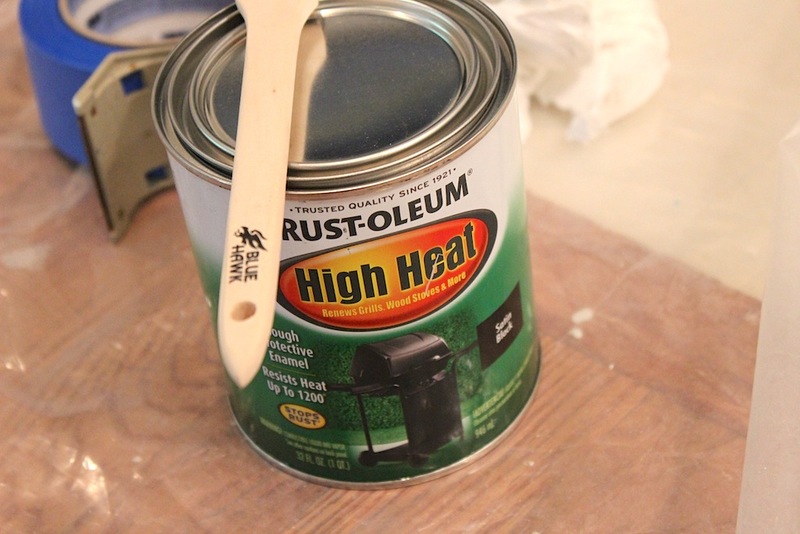 After cleaning the area and taping it off, we used Rustoleum’s High Heat paint to cover it right up. 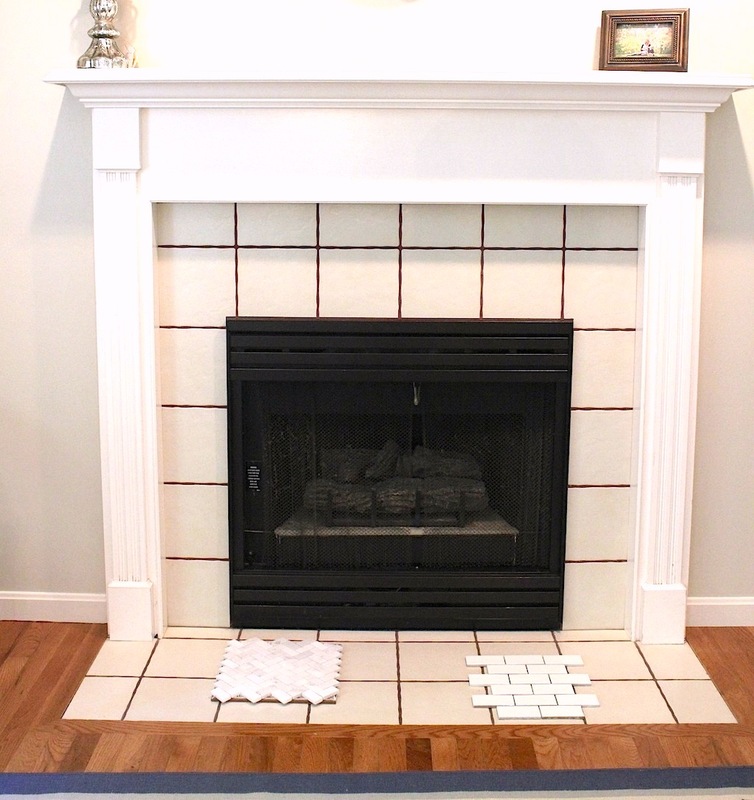 Two coats later and we had a semi-new fireplace! I’m still eager to get the tiling done, but this quick update was one step in the right direction! Weather seems to be all over the place these days. Last week we were nearing the 90’s and this weekend that temperature dropped by somewhere around 20 degrees! We’ll be back into the 80’s as the week goes on, but it was a nice taste of ‘sweater weather’. I was happy to give this new lacy top a spin and look forward to wearing it more over the months to come. For now, I’ll continue to break the ‘no white after Labor Day’ rule because that one was clearly made to be broken! Yesterday was a chilly, rainy day here in central Pennsylvania which really had things feeling like fall. That combined with my Instagram feed being 75% full of NYFW eye candy lured me into a little online browsing. As big of a fan I am of pastels, I’m finding myself eager for some rich, deep hues for the coming (or is it here?) season. 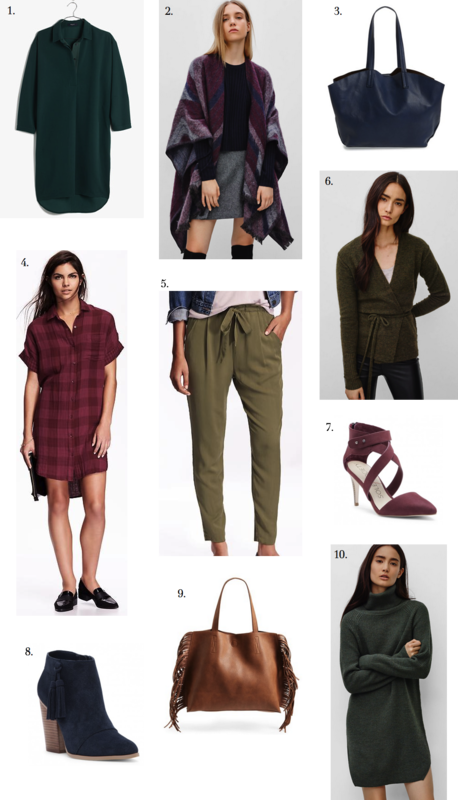 Emerald, olive, burgundy, navy, cognac….I can’t wait to layer up in them all. Here’s a little bit of what I found during my hunt yesterday. Where do I start?? Maybe the cape. Or the sweater. 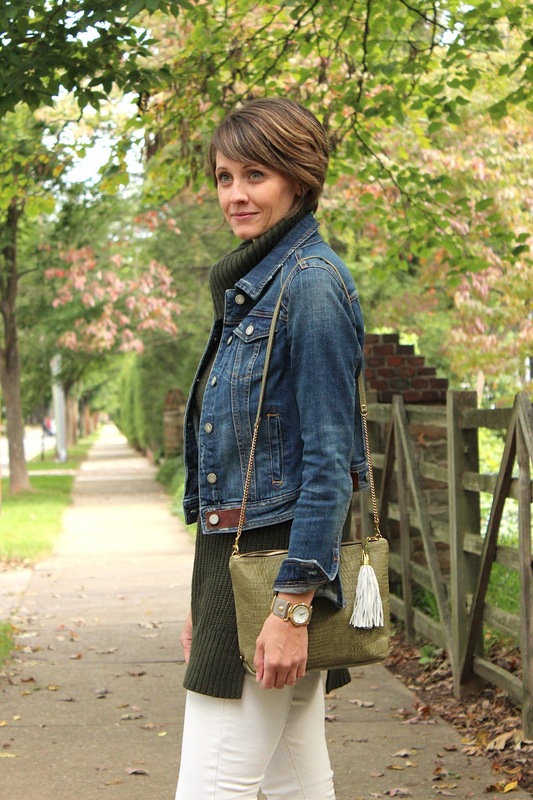 Or the fringe (for $27!)? Ah! I’ve been tempted by this style of vest for a while now but always felt a little intimidated by it. I don’t know why. 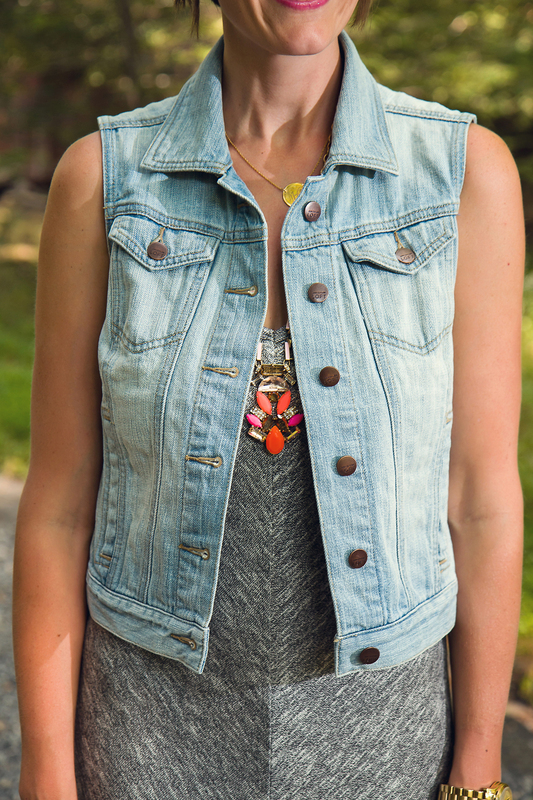 I love vests, I love blazers and this is pretty much the perfect combo. When I passed it on the rack at Target (yes, Target) I threw it in my cart without even trying it on. Somehow I just knew it was meant to be mine. 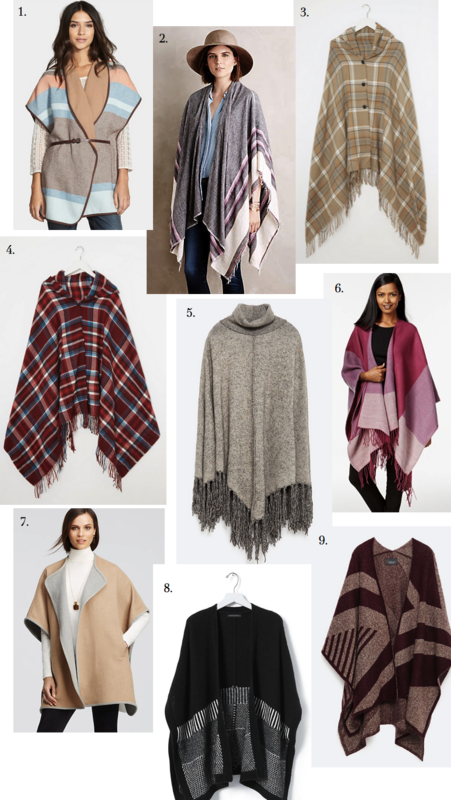 When I’m trying out a trend I’m not quite sure about, Target prices are all I’m likely to spend. Turns out, it’s perfect. I love the tailored yet fun look that resulted by pairing it with some jogger pants and was all too ready to pull out my blue suede shoes. Looking forward to figuring out a few more ways to style this one!